"I made this recipe at the fire hall and it was a big hit! It is somewhat healthier as well." Preheat oven to 450 degrees F (230 degrees C). Grease a 9x13-inch baking pan. Heat a skillet over medium heat. Add chicken; cook and stir until browned on all sides, about 6 minutes. Transfer chicken to a plate. Heat oil in the hot skillet. Add tomato, bell pepper, and onion; cook and stir until softened, 5 to 7 minutes. Mix in cooked chicken, water, and fajita seasoning. Line the bottom of the prepared pan with 5 tortillas; pour pinto beans on top. 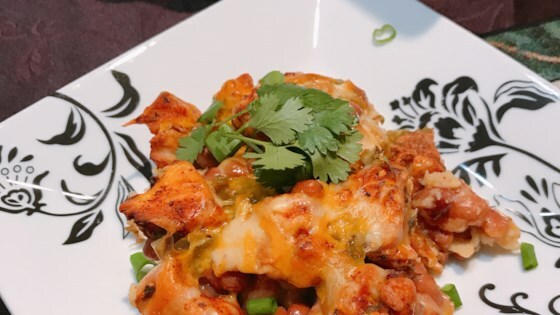 Spread 1/2 of the chicken mixture over the beans; cover with Cheddar cheese. Layer the remaining tortillas, black beans, and chicken mixture on top. Cover with aluminum foil. Bake in the preheated oven until tortillas are lightly browned and chicken juices run clear, 25 to 30 minutes. Top with green onions and cilantro. Super tasty and tons of it! I have massive amounts of leftovers that I am EXCITED to re-heat and devour! I drained the extra water from the chicken vegetable mixture before I added it to the dish. Turned out perfect! Ate it with sour cream . My wife and I think we will use salsa next time we will make this dish. Family loved it. Definitely will make again. Added chipotle peppers in with pepper & onion mix for added heat, and it came out amazing! Not too hot but not bland like others said. Used extra cheese on top too. Given the ingredients I’m surprised it was not more flavorful. I’m not a fan of baked tomatoes, so maybes add them at the end. Decent, but nothing to rave about.